Mark, I don't know how much time this car spent at the strip. I beleve it was mainly a street car and probably wasn't ordered new as a strip only car as it has 3.73 gears, PS, and disc brakes. It seems that most of these L72 cars that were ordered for strip only use had digger gears and manual steering and brakes. The rearend cover has dents poking out and chew marks on the inside. 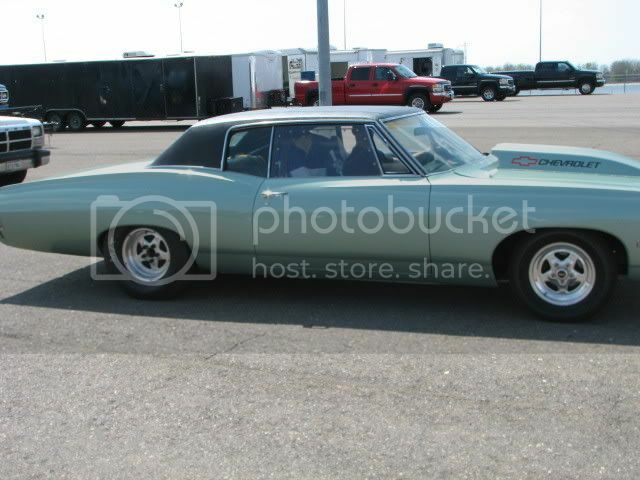 It has GM 3.73 gears dated 1969, so I think the rear was blown early in its life, probably at the strip. 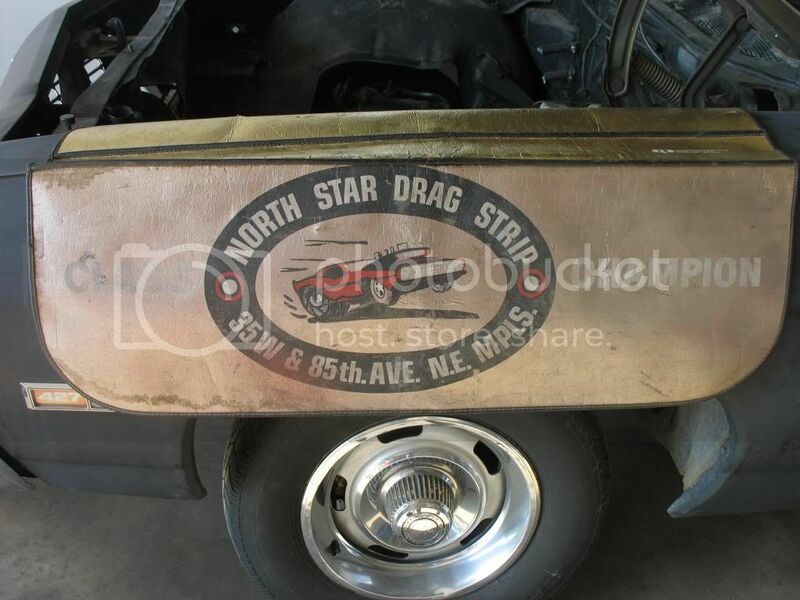 I don't know if it was raced at MN Dragways but I've talked to two people that remember it at Northstar with the white paint job. I'm not sure when it was painted white w/stars and stripes but I would assume 1976 or later. i was born in '79 so this was all before my time. Rich Mahle (spelling?) was the guy who raced it. I live in SE MN near Adams, MN which is about 5 miles from the IA border. Rich's name is not familar to me. Do you know or have you contacted any of the stock/SS racers that were around then in the Twin Cities? 69 Bel Air 2 Door Sedan "Project Junior Stock"
Mark, I have not talked to any of the SS racers from back then, but I did start a thread on twincityoutlaws.com to see if anyone remembers the car. One guy on that site remembers it and was going to look through his pics but I haven't heard back lately. If you find a pic with my car in the background I would gladly pay you for it. A friend of Rich's thought the custom paint job was done by "Peanuts". I should try to contact him, maybe he took pictures of his work. 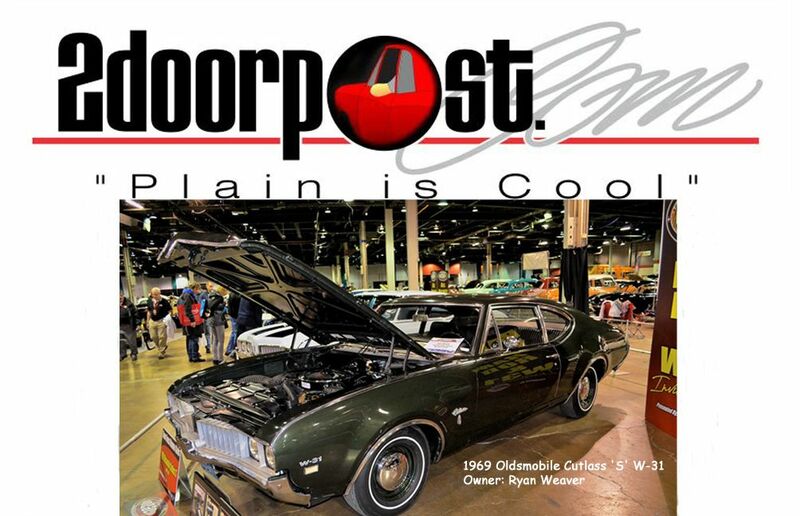 I purchased an NOS Caprice coupe quarter from Karl D (postguy). It has plenty of dents and a couple of cracks but it's much better than aftermarket patch panels. Karl also sold me this super solid custom coupe from AZ for parts. I recently met the second owner of the Biscayne and bought some parts from him. 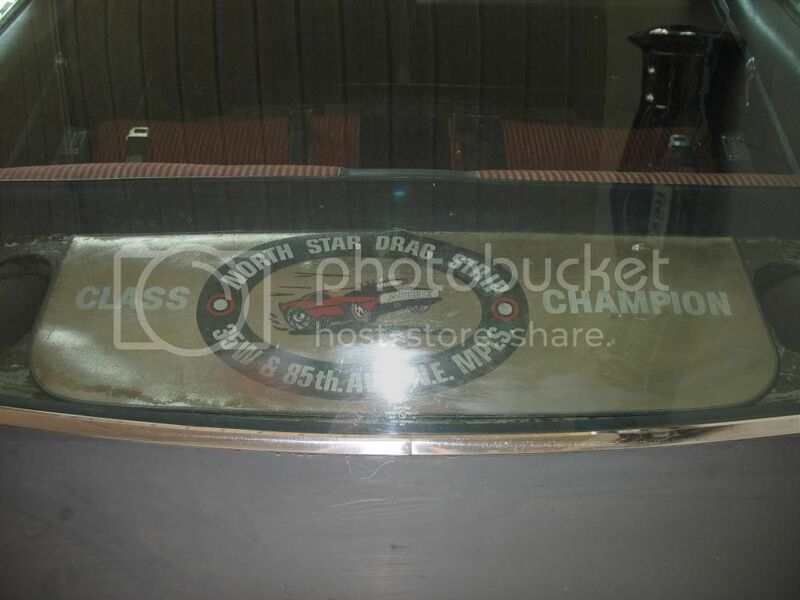 I got this Class Champion fender cover from Northstar Drag Strip that was won by this car. When he bought the car in about 1989 the fender cover was displayed on the rear package tray and that is why the gold is faded. 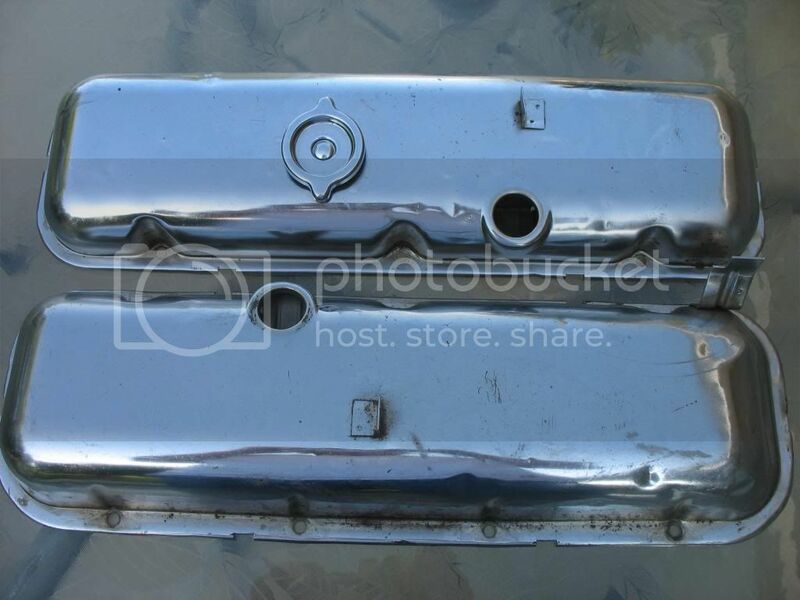 I bought these chrome dripper valve covers that came with the car when he bought it. He's pretty sure that they are the originals from the car. The plug wire loom bracket is missing on the right cover and they have some dents but they may be restorable. I also bought 8 NOS dimple rods. Nice grabs on the parts,those surely dont come by very often. My Dad always spoke about dimple rods and pink rods and how much they could be purchased for in "his days" to which we kept reminding him its not the late 60's early 70's anymore. He always said that he could buy a set of either for less than 89 bucks a set. 1966 Chevrolet Belair Sleeper project. Your parts car is almost like my brothers car he races. Hey Chad, It was good to meet and chat with you in Spearfish for the NIA convention. Thats some nice stuff you picked up, Looks like you may not need to use that NOS qtr as that parts car looks good enough to cut them off. Awesome fender cover. 67 CDN 427 biscayne all #'s. Brian, I love your brother's race car. My first car was a Grecian Green custom coupe just like your brother's except mine doesn't have a vinyl top. I bought it when I was 13 for $150 and I still have it......and it's still tore apart. Andrew, it was great to meet you and hear about your cars. I had a great time in Spearfish. I am going to cut the quarters off the parts car but I will still probably use the NOS Caprice panel on the Biscayne because it has far less trim holes to deal with. My custom coupe also needs quarters so the panels off the parts car may get used on that car. I think the fender cover is awesome also and I was tickled to get it. THAT is some awesome news to hear. We always speak of the ones that got away, but NOT in your case. Good on ya. over to a TH400 for the auto trans stock class that it ran. I don't recall that car ever being painted white though. Are you in MN? Mark, do you remember any details about that car or who owned it. I'm talking to a guy who thinks his buddy may have bought my car new and he raced it at Minnesota Dragways when it was new. 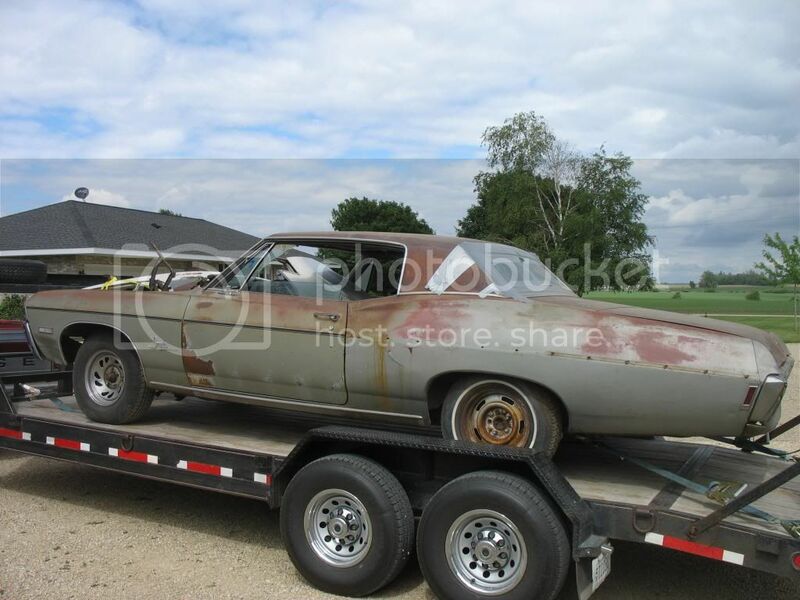 Wow, you do have your work cut out for you, but certainly worth it to save a real deal L72 car. I'll keep watching your progress. I just read the previous thread.....very cool, I wish you still had her....we all have similar stories. Hey Chad, Any updates on your '68 or progress finding the parts? I have not started on the restoration but I have been buying lots of parts, mostly NOS. 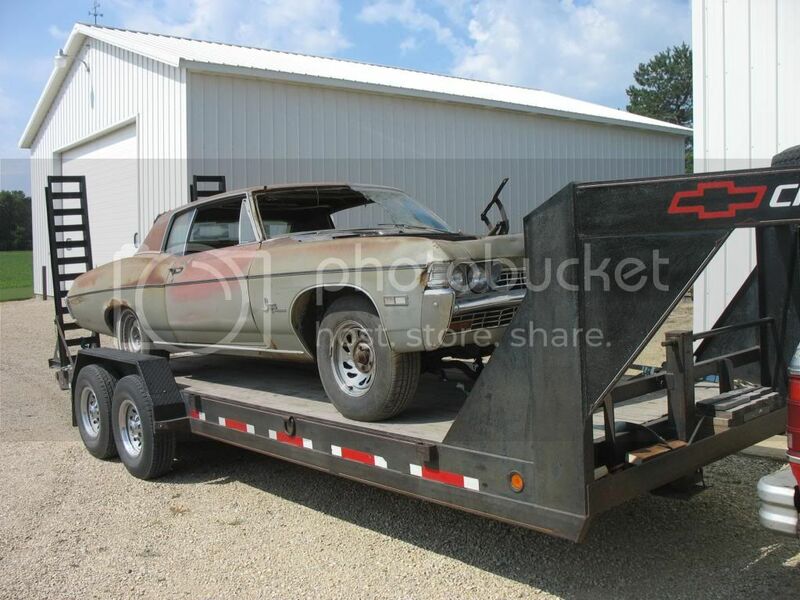 I purchased a complete L72/M21 that was removed from a '68 SS427 in about "73. It has never been damaged and is still standard bore. The engine was rebuilt in the 80's for a '69 Camaro but thankfully never found its way into the car. The car it came out of was built at the same plant (Janesville) and on the same week is my car so the dates are perfect. If you take the VIN of my car and subtract the VIN on the engine it equals 427!! I think that's kind of cool. It still had the smog system and Muncie shifter when it was pulled from the car which is unusual as those items were usually the first to end up in the trash. I will post some pictures later.